Alexandria is located in the heart of Central Louisiana (CenLA) and is a vibrant commercial, retail, educational and healthcare center. It lies on a level plain of Longleaf Pine forests at 55 feet above sea level, in almost the exact geographic center of Louisiana. It is the parish seat of Rapides Parish. The Red River has played key roles in Alexandria and neighboring Pineville through the decades, and centuries, through peaceful times and through the Civil War, through low stages of the river, and in floods. A series of locks and dam built by the U.S. Army Corps of Engineers have made the Red River navigable through Alexandria. The population of the City of Alexandria in 2010 was 47,723, with neighboring Pineville across the Red River having 14,555 residents. The Alexandria Metropolitan Area, encompassing all of Rapides and Grant parishes, has a population of 153,922. Rapides Parish has a total population of around 132,374 people. Alexandria has a mayoral-council system of government, with the Mayor serving as the executive branch of the local government. The current Mayor is Jacques Roy, first elected to office in November 2006. The Alexandria City Council serves as the legislative branch. The five districts of the city are represented on the Council, and two other council members are elected to serve as at-large representatives of the city. The Rapides Parish Police Jury is the governing authority for the Parish which operates under the police jury system as provided by the general laws of the State of Louisiana. The Police Jury is both a legislative and administrative body. Its legislative functions include enacting ordinance and resolutions, establishing programs and setting policy. Alexandria is located in the Fifth Congressional District of Louisiana. Even in difficult economic times nationally, employment and job search opportunities in Alexandria have remained strong, and better than much of the US. Alexandria's diverse economy remains robust with its base in the manufacturing, retail, timber, education, hospitality and health care industries. Employment is stable, and better than much of the US. The Alexandria-Pineville area lies in Area Code 318. Alexandria uses Zip Codes 71301, 71302, 71303, 71306, 71307, 71309, and 71315. Pineville is assigned Zip Codes 71359, 71360, and 71361. The Alexandria Museum of Art was founded in 1977 and occupies an historic Rapides Bank Building on the banks of the Red River. The bank building was constructed in 1898 and is listed on the National Historic Register. The Louisiana History Museum is located downtown on the bottom floor of the former library. The museum showcases the history of all Louisiana, with emphasis on the central portion of the state, Rapides Parish, and Alexandria. Major exhibit areas concern Native Americans, Louisiana geography, politics, health care, farming, and the impact of war. The performing arts are centered in the Alexandria Cultural Arts District in downtown Alexandria. Located downtown are three performance venues: Coughlin-Saunders Performing Arts Center, Hearn Stage, and the Riverfront Amphitheater. Popular area events include CenlaBration, RiverFest and Mardi Gras. Alexandria, as a popular convention destination, calls upon the hotel industry in the area to house many out-of-town visitors. The Alexandria Riverfront Center in downtown Alexandria on the Red River offers all the amenities of big city convention centers combined with the convenience of being centrally located within Louisiana. It features over 35,000 feet of usable convention and meeting space. The Alexander Fulton Hotel is adjacent to the Center. For additional information, link to the website of the Alexandria Riverfront Center. 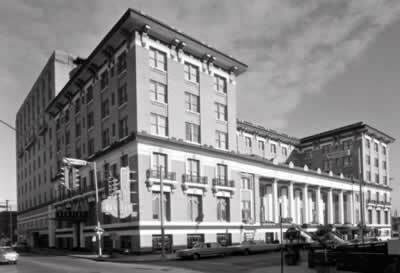 The Hotel Bentley, built in 1908 on Third Street in Alexandria, has long been the flagship hotel in Central Louisiana, offering luxury and amenities for tourists and business travelers. As recently as the 1980s, the Bentley was designated a four star hotel, the only four-star hotel in Louisiana outside of New Orleans. In the late 1990s, the hotel changed ownership and became affiliated with the Radisson chain, and renamed the Radisson Hotel Bentley. The Hotel Bentley is located at 200 Desoto Street, adjacent to the Alexandria Riverfront Center and the Alexandria City Hall. The famous Mirror Room in the Bentley reopened in 2015, and guest rooms became available in May of 2016. MacArthur Drive is an 8-mile long multilane bypass around the western side of Alexandria. Throughout its length it bears the designation of US Highway 71, and in places the additional road numbers for US 165, US 167, and LA 28. In Alexandria, the main part of MacArthur drive (U.S. 71) south of the traffic circle at the intersection of Business 165, 165, and 71 is also called Jefferson Highway. In 1961, the Alexander Fulton bridge was completed across the Red River, connecting to the new Alexandria-Pineville (Cottingham) Expressway, and providing a third traffic bridge across the river. This bridge was demolished in 1994 to clear the path for the Purple Heart Memorial Bridge. The old O.K. Allen Bridge has been imploded and is being replaced by the Fort Buhlow Bridge built by the Louisiana Department of Transportation & Development at a cost of $83 million and opened in 2016. The $1.9 billion Red River Waterway Project, authorized by Congress in 1968 added a series of five lock and dam complexes to the river. These structures perform a stair-step effect on the river, creating controllable pools and passageways for river traffic. The project has led to the Port of Alexandria, an active facility for both imports and exports, with connections to the Mississippi River. In the 1990s, the Alexandria witnessed the construction and opening of Interstate I-49. I-49 connects with Lafayette to the south, and Shreveport to the north. Alexandria is the major healthcare center for all of Central Louisiana. 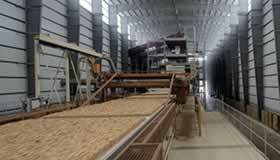 It features a large number of doctors, clinics, facilities and hospitals. Among the facilites located in the Alexandria-Pineville area are the Rapides Regional Medical Center, CHRISTUS St. Frances Cabrini Hospital, Central Louisiana State Hospital, and the Veterans Administration Medical Center. Louisiana State University at Alexandria (LSUA), located just south of the city, is a regional campus of the state's flagship university system, Louisiana State University. From its establishment in 1959, the campus offered only two-year degrees. In 2002, following approval by the Louisiana State University Board of Supervisors and the Louisiana Board of Regents the Louisiana Legislature passed legislation allowing LSUA to offer baccalaureate degrees. Elementary and secondary schools are provided by the Rapides Parish School system. A number of private and parochial schools are also available in the area. The present site of Alexandria was a natural one for settlement due to its location on the Red River in Central Louisiana. The area was originally home to a community supporting activities of the adjacent Spanish outpost of Post du Rapides. Ultimately, Alexandria would became the parish seat of Rapides Parish. A community of traders and merchants lived and worked in the agricultural lands bordering the mostly unsettled areas to the north, and providing a link from the south to the El Camino Real and then larger settlement of Natchitoches. Alexandria was then platted to Alexander Fulton, who obtained it as a land grant from Spain in 1785. Fulton, a Pennsylvania trader, purchased additional land from the Choctaw, Tensas, Appalachee and Pascagoula tribes through his store. Fulton laid out the plan for Alexandria in 1805, and the settlement grew rapidly. Because of its strategic geographic location, which still holds true today, it became a center of transportation, trading and agriculture. The origination of the city's name of "Alexandria" is still a fact for history to decide. Some historians claim it was named after Fulton himself. Still others believe that Fulton named the town after his infant daughter who died about the time the town was platted. The town was first incorporated on March 18, 1819, and received its official charter from the Louisiana Legislature in 1832. England Air Force Base has its roots as Alexandria Municipal Airport. In 1939, city officials recognized a need for a municipal airport to handle commercial air traffic. The site they selected was just northwest of the city, roughly between Bayou Rapides and Louisiana Highway 1. It became known as Alexandria Army Air Base at its opening on October 21, 1942. When the Air Force decided to build a permanent air base in Alexandria in 1954, the City donated the bulk of the acreage occupied by the base. Later, on June 23, 1955, it was renamed England Air Force Base in honor of Lt. Col. John Brooke England, Commander of the 389th Fighter Bomber Squadron at Alexandria AFB, who died in a crash in France. In October 1990, the Defense Base Closure and Realignment Commission dictated that England Air Force Base would be closed by September 1992. EAFB was officially closed June 1, 1992. Since 1992, the England Authority has successfully transitioned the area to England Airpark which includes, among other facilities, Alexandria International Airport (AEX). The base was transferred to the England Air Park and Community, and this organization has achieved great success in transforming the base into a usable, vibrant business and residential area. Today, the Airpark houses houses Alexandria International Airport (AEX), golf courses, a hotel, restaurant and major businesses and industries such as Union Tank Car. The Oak Wing Golf Club is a 220-acre public 18- hole course located along the scenic banks of Bayou Rapides and Bayou Le Tig. 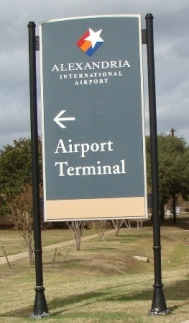 Also located in the Air Park is Alexandria International Airport (AEX). When EAFB closed, commercial airport operations were transferred from Esler Field which is located east of Pineville. AEX continues to serve the military as a loading and unloading station supporting nearby Ft. Polk through a commercial lease with the military. This arrangement has resulted in approximately $60 million being invested in the airfield’s facilities. England Airpark and AEX proved their value as a disaster relief staging and support area in the wake of Hurricanes Katrina, Rita, and Gustav. As the regional airport serving central Louisiana, AEX serves over 250,000 passengers with over 50,000 air operations per year through commercial and private airlines. England Airpark continues to be successful at drawing investment to the park and the surrounding community. According to the Louisiana Economic Quarterly, England Airpark has leveraged $502 million in direct private investment and employs more than 2,000 people. Direct sales revenue has been reported as $2.8 billion. 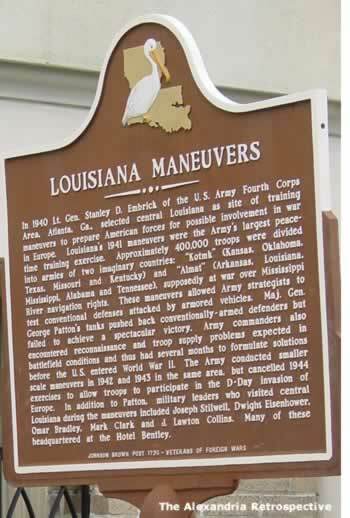 Alexandria and Central Louisiana were the site of the massive Louisiana Maneuvers staged just before World War II. Numerous military camps were built in the CenLA area to support the growing war effort: Camp Livingston, Camp Claiborne, Camp Beauregard, Esler Field, Pollock Army Air Field, Alexandria Army Air Base, and others. Camp Polk was located further west of Alexandria near Leesville. To speed military vehicles around the area, a new four lane loop named MacArthur Drive was constructed through what was farms and pastures on the western outskirts of Alexandria. Except for Camp Beauregard, all of the army camps and air bases closed soon after the end of the war. England Air Force based emerged again in the 1950s as a significant military post.